Martial Arts Fan Self Defense Weapon | BUDK.com - Knives & Swords At The Lowest Prices! 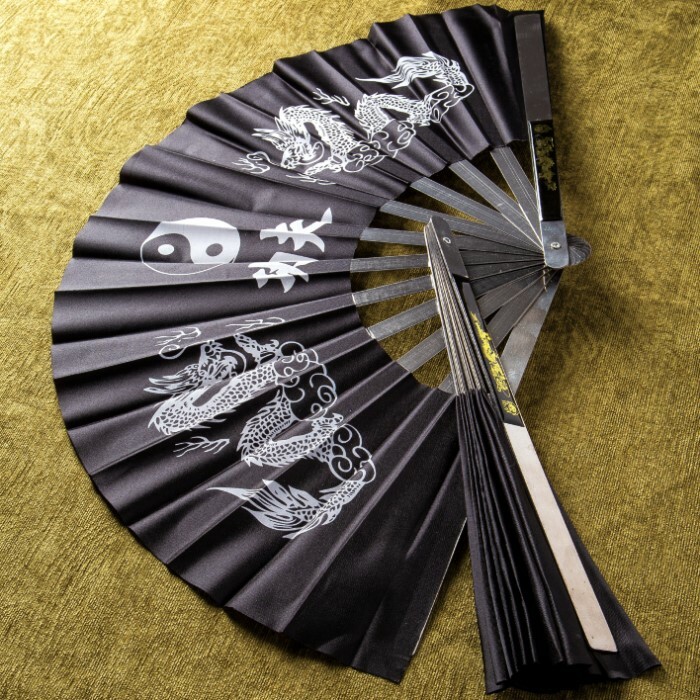 Fans are extremely popular weapons in the Chinese Martial Arts area because of their ability to surprise unsuspecting enemies. This Kung Fu Fan features black cloth and features the Kanji symbols for “Kung Fu" along with yin yang symbols and a dragon. 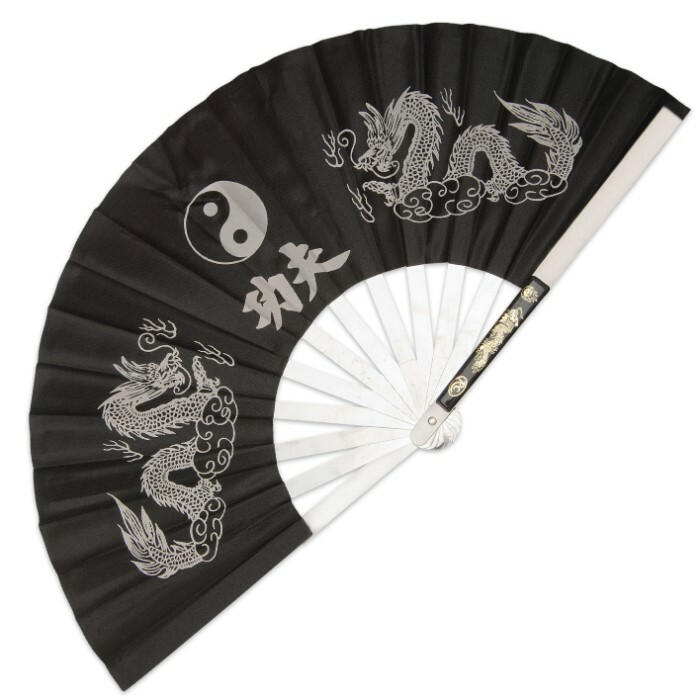 This fan is made from stainless steel with the nylon taffeta cloth and measures 13 1/2" long when folded. 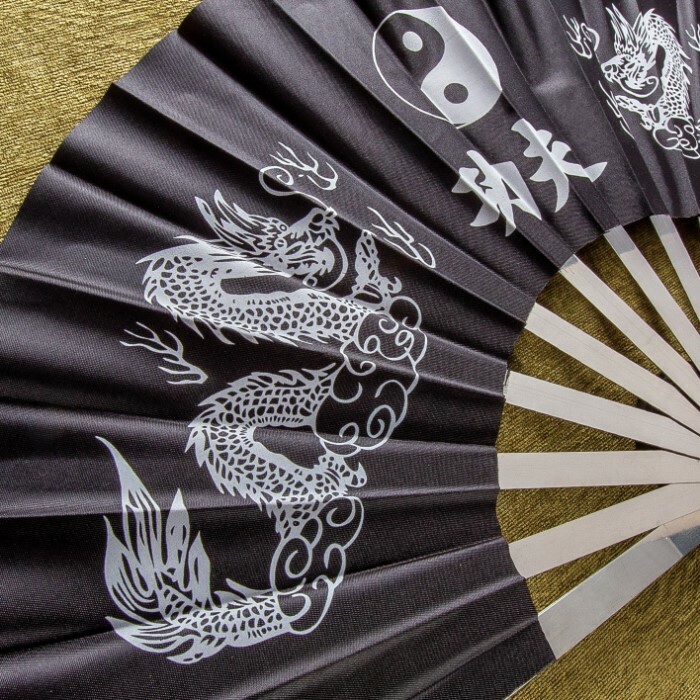 Great for decorating your home or dojo or it can even be used in Kung Fu weapons demos. Bought 5 fans for my wife and daughter to use for competition. They were on special so thought I would give them a go..... Four out of five seem OK but fifth one started letting go very first use. Buyer beware, I would buy these if they are important to you or for them ones you purchase them for. Love the overall design, but wish it was sharpened and it had more blades. So, I read about fighting fans in a ninja book, so I got one for my sister. She loved it! It is VERY large, VERY heavy! Be sure to expect BIG!!! Hanging it was also tricky, but she managed. Now, as seen in the picture, it has metal blades instead of wood. However, these blades are as dull as all get out. Also, the blades are exposed on the back, so if you hold it wrong, anybody could tell. So, it makes a wonderful historical and ninja display, but if you want real razors, go somewhere else. I use this fan as a blinder for my very aggressive dog. It's easy to open-hold one side and drop the other and it opens with a SNAP! What the dog can't see doesn't bother him. Not weapons grade, but if the glue holds, I'm a happy camper. When I opened the fan, none of the metal was glued to the fabric. I tried to use Elmers to reattach the blades, but it bled right through the fabric. I just returned it and asked for a replacement. I think I'll put it on display, but it's not quality enough to open it very often. The glue that holds the fabric material to the metal doesn't hold up even under the most casual use. When I tried to glue it myself it bled through the fabric and ruined the fan. It's a terrible product that deserves a zero star ranking. 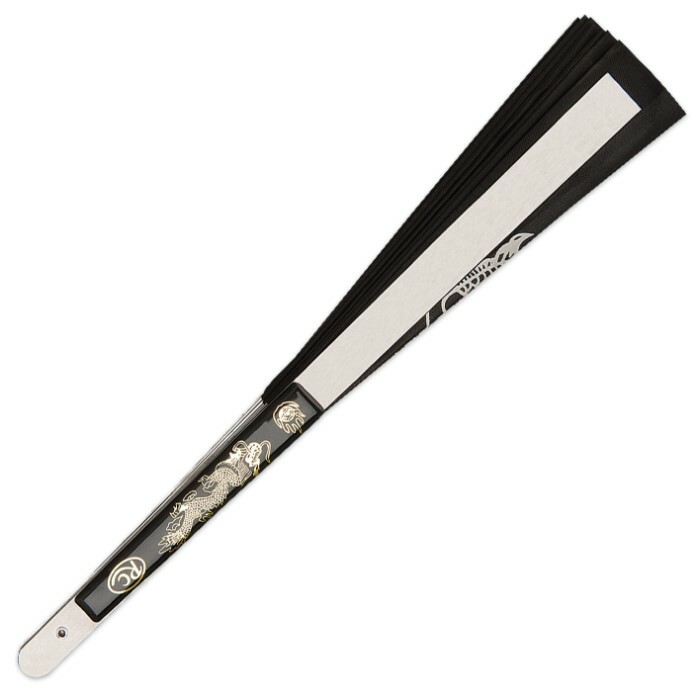 Ordered Two Of These, I Love Them, Theyre Sturdy And Open Smoothly. Decent, though it could have been a little heavier. The characters are actually traditional Mandarin Chinese, not Japanese Kanji, though the meaning of the characters is correct. Overall, not a bad purchase for practice. I bought this fan as a Christmas present for my friend. I gotta say I didn't think that it would be so heavy duty, this is defiantly a fighting fan and she is going to love it!